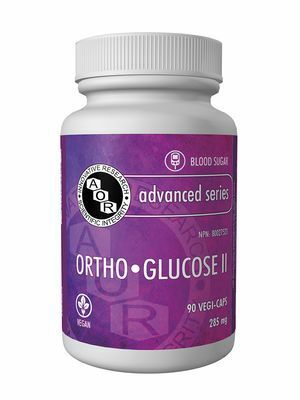 Ortho• Glucose II is AOR's premium blood sugar balance formula, containing the most well-researched nutrients and plant extracts studied in humans with hyperglycemia including bitter melon, Gymnema sylvestre, R+ lipoic acid, chromium picolinate and cinnamon extract. Primary Uses: Ortho• Glucose II supports healthy blood sugar metabolism and may help reduce the symptoms of hyperglycemia. Hyperglycemia increases the risk of many serious health complications including cardiovascular disease, retinal damage, blindness, neuropathy and many others. The ingredients in Ortho• Glucose II have been shown to enhance the activity of insulin, improve the cellular uptake of glucose, and possibly repair the beta cells in the pancreas that produce insulin. Ortho• Glucose II also reduces the risk of complications resulting from chronic high blood sugar levels such as numbness in the limbs, high cholesterol and heart disease. Ortho• Glucose II is the ideal addition to healthy lifestyle changes for those trying to regain normal carbohydrate metabolism, healthy blood sugar levels and reduce the symptoms and risks associated with hyperglycemia. CAUTION: Do not take if you have acid reflux, stomach or intestinal ulcers, or if you are pregnant or breastfeeding. Discontinue use and consult a health care practitioner if you experience symptoms of hypoglycemia including feelings of anxiety, dizziness, tremor, sweating, nausea or headache. May cause irritation of the gastric mucous membranes and reflux. Consult a health care practitioner prior to use if you have a kidney disorder, diabetes or liver disease caused by alcoholism or chronic acetaminophen use.